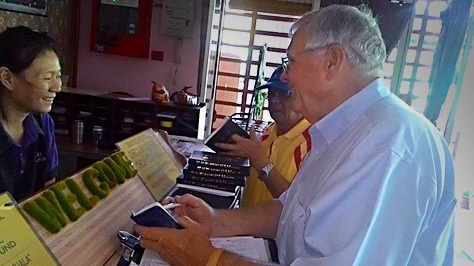 Montie Matlock, a Gideon from the USA, talks with a hotel clerk during the 2016 Malaysia blitz about the plan of salvation. Last week, Gideons in Malaysia welcomed Gideons from other parts of the world as they came together to witness and share God’s Word during the 2016 Malaysia International Scripture Blitz. On the Sunday before leaving for the blitz, Montie Matlock, a Gideon from Jackson, Tennessee, stood in the hallway of Englewood Baptist Church with his pastor, Jordan Easley. The pastor prayed for Montie as he was about to head to Malaysia and start the work of placing Scriptures in hotels, schools, and jails. The Gideons of Malaysia were very encouraged to have Gideons from other countries of the world come to the city of Penang to help them reach the lost for Jesus. As the teams made Scripture distributions at schools, the Malaysian Gideons would run from student to student, placing God’s Word into their hands. “They were all in,” says Matlock in terms of their dedication in sharing the Gospel. The restrictions in Malaysia on sharing Scriptures makes distributing God’s Word there especially challenging. However, God’s Word gets through despite the country being a mix of Islam (60%), Buddhist (19%), Christian (9%) and Hindu (6%) amongst others. By the end of the week-long blitz, Gideons and Auxiliary distributed more than 38,500 copies of God’s Word. Scriptures were distributed in three different languages: Chinese, English, and Tamil. The Gideons International is an association of Christian business and professional men and their wives dedicated to telling people about Jesus through sharing personally and by providing Bibles and New Testaments. While we are known worldwide for our work with hotels, we predominantly share Scriptures in schools and colleges, prisons and jails, hospitals, and medical offices. We also provide Scriptures daily to police and fire personnel and members of the armed forces. The Gideons International partners with churches anywhere, to reach the unreached everywhere—from Jackson, Tennessee to Penang, Malaysia. Follow us on that journey by becoming a prayer partner. Knowing that our Lord is able to bring forth water out of solid rock, I do not fear that the seeds planted here will flourish and grow, even in this rocky ground. God is awesome, and many thanks and congratulations to the team that went forth. Great job guys! We are thankful and glory to be God in highest together. As Jesus said to disciple that the harvest are plentiful but the laborers are few so pray to the Lord of harvest sending more laborers in harvest everywhere had people breathed and ask God open door of salvation to all population had heard the Good News to fulfill in John 12:32 Jesus said that when I will be lifted up from ground I will draw all the souls back to God. As we know that in the world there are around 6 billion populations , but just there are 1/3 believed in Christ . So we are appreciate to be partners with Gideon International are distributing the N-T more than 2 billion the Scriptures . We are thankful and glory to God in highest. According in Phip2:5-11 Have this mind among yourselves, which is yours in Christ Jesus who,though he was in the form of God, did not count equality with God a thing to be grasped, but emptied himself,by taking the form of a servant,being born in the likeness of men.And being found in human form,he humbled himself by becoming obedient to the point of death ,even death on a cross.Therefore God has highly exalted him and bestowed on him the name that is above every name so that at the name of Jesus, every knee should bow,in heaven and on earth and under the earth and every tongue confess that Jesus Christ is Lord,to the glory of God the Father.So Jesus said to that when the Holy Spirit has come upon you , and you receive power,and you will be my witness in Jerusalem and in all Judea and Samaria and to the end of the earth. So we are so glad to be partner with the Gideon International, to distributed the scriptures together.